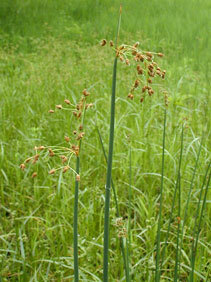 Culms: Erect, stout, unbranched, round in cross-section, to 1 inch in diameter, soft, pale green, glabrous. Leaves: Mostly sheathing and without blades, upper ones sometimes with tapered blades. Inflorescences: Umbels, panicle-like, loose, much-branched, terminal, consisting of numerous compact clusters of 1-5 spikelets on rays .5 to 2.5 inches long; bract usually solitary, erect, leaf-like, round in cross-section, shorter than inflorescences, appearing as a continuation of culm. Spikelets: Sessile or stalked, egg-shaped to cylindric, to 1/2 inch long, many-flowered; tips nearly pointed; flowers perfect; scales ovate to nearly round, as long or slightly longer than achenes, reddish brown, midribs greenish; tips abruptly short-pointed; bristles 4-6, at bases of flowers, as long or longer than achenes; stamens 3; styles 3-cleft. Fruits: Achenes, egg-shaped, 3-angled, brown, 1-seeded. Habitat: Marshy areas, pond and stream edges, and wet roadside ditches, most abundant in shallow water or moisture-saturated soils. Uses: Native Americans used the roots and stem bases for food and weaved baskets and mats from the stems. Comments: Soft-stem bulrush often grows in colonies. The roots spread under water or below the surface of the soil and form a mat of new shoots. The seeds can remain dormant for several years.